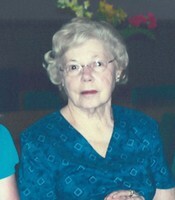 Provide comfort for the family of Eleanor McKimmon with a meaningful gesture of sympathy. McKIMMON, Eleanor Margaret (née Roth) - Mrs. Eleanor McKimmon passed away peacefully at the Village of Riverside Glen, Guelph on Tuesday, April 2, 2019 at the age of 97. Beloved wife of the late Andrew "Andy" McKimmon (1999). Survived by her sister Rose Keller and 26 nieces and nephews. Predeceased by her siblings Frank Roth, Rita Scott, Dorothy Devine, Marie Fischer, William Roth and George Roth. Eleanor and her husband Andy were the proprietors of Eleanor's Good Food Restaurant and Banquet Hall on Woodlawn Road in Guelph for 32 years. Thank you to the staff at the Village of Riverside Glen and the Stone Lodge for their care and support. Friends are invited to the Gilbert MacIntyre and Son Funeral Home, Dublin Chapel, 252 Dublin Street North, Guelph on Thursday, April 4, 2019 from 2-4p.m. and 7-9p.m and on Friday, April 5, 2019 from 10-11a.m. A funeral service will be held in the chapel on Friday, April 5, 2019 at 11a.m. Interment at Woodlawn Memorial Park, Guelph. As expressions of sympathy, donations to Diabetes Canada would be appreciated by the family. Online donations and condolences can be made at www.gilbertmacintyreandson.com. We encourage you to share your most beloved memories of Eleanor McKimmon here, so that the family and other loved ones can always see it. You can upload cherished photographs, or share your favorite stories, and can even comment on those shared by others.